Heel pain is most often caused by plantar fasciitis, a condition that is sometimes also called heel spur syndrome when a spur is present. Heel discomfort may also be due to other causes, such as a stress fracture, tendonitis, arthritis, nerve irritation, or, rarely, a cyst. Because there are several potential causes, it is important to have your foot properly diagnosed. A foot and ankle surgeon is best trained to distinguish between all the possibilities and determine the underlying source of your foot pain. Plantar fasciitis is an inflammation of the band of tissue (the plantar fascia) that extends from the heel to the toes. In this condition, the fascia first becomes irritated and then inflamed-resulting in pain. -Pain that increases over a period of months. The most common cause of plantar fasciitis relates to faulty structure of the foot. For example, people who have problems with their arches—either overly flat feet or high-arched feet—are more prone to developing plantar fasciitis. Wearing non-supportive footwear on hard, flat surfaces puts abnormal strain on the plantar fascia and can also lead to plantar fasciitis. This is particularly evident when a person’s job requires long hours on their feet. Obesity also contributes to plantar fasciitis. To arrive at a diagnosis, the foot and ankle surgeon will obtain your medical history and examine your foot. Throughout this process the surgeon rules out all the possible causes for your heel pain other than plantar fasciitis. In addition, diagnostic imaging studies such as x-rays, sonography, a bone scan, or magnetic resonance imaging (MRI) may be used to distinguish the different types of heel pain. 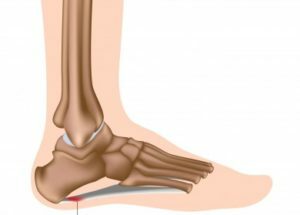 Sometimes heel spurs are found in patients with plantar fasciitis, but these are rarely a source of pain. When they are present, the condition may be diagnosed as plantar fasciitis/heel spur syndrome. Treatment of plantar fasciitis begins with first-line strategies, which you can begin at home: Stretching exercises. Exercises that stretch out the calf muscles help ease pain and assist with recovery. Physical therapy. Exercises and other physical therapy measures may be used to help provide relief. A common modality for PT treatment is called iontopheresis. Iontophoresis is using a small electric charge to deliver a medicine or other chemical through the skin. Basically an injection without the needle. Extracorporeal Shockwave Therapy or ESWT is a method of treatment of kidney stones (Extracorporeal Shockwave Lithotripsy), shoulder tendinitis, and other conditions such as plantar fascitis by application of high-intensity acoustic radiation. To learn more about shockwave therapy in the podiatry today article. Most insurance companies have stopped paying for this treatment. Coblation surgery (aka Topaz procedure) has been used successfully in the treatment of recalcitrant plantar fasciitis. This procedure utilizes radio frequency ablation and is a minimally invasive procedure.